Come help us celebrate the debut of Cronkite 2.0! It's our first live show since adding lead guitar to the lineup and becoming a four-piece band. Lot's of new songs to share! Axis is ours for the night. We'll have a tab running at the bar for everyone from 7-8pm so come early and have a drink on us. 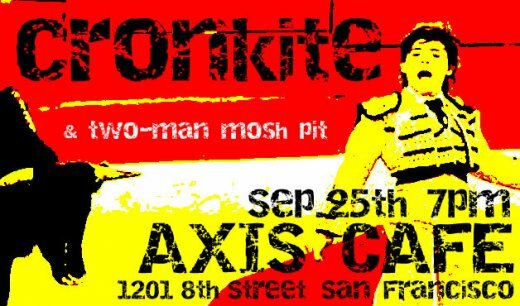 Two-Man Mosh Pit hits the stage at 8:00pm. Cronkite goes on around 9:00. That's fine if you have new songs to share, but if we don't hear "Wrong Question," there are going to be some very angry people in that room. Sorry to miss the show but we have father-in-law visiting. Hope it goes well! I wasn't able to post a link to our website in the description above so i'm posting it here instead: http://www.cronkite.net.